The earliest evidence of people in Kerry dates back to 6,500 years ago when hunter/gatherers had a temporary camp at Ferriter’s Cove on the Dingle Peninsula. Archaeological sites are scattered throughout Kerry’s landscape: passage tombs on the hill tops, ancient copper mines, promontory forts on the sea cliffs, ogham stones, Early Christian monastic settlement, Viking houses, medieval castle, grand houses – all there for you to explore. If wedges, ring forts, inscribed crosses, ogham stones and oratories interest you, then you should go west to the Dingle Peninsula. As well as having some of the most beautiful and rugged coastal scenery in the country, it has an exceptional variety of prehistoric and Early Christian remains. Dunbeg Fort, 3 km west of Ventry, is a fort built by early settlers to Kerry. A kilometre further on at Fahan is a marvellous treasure chest of Beehive Huts, eighteen Standing and Inscribed Stones, two Sculptured Crosses and seven Earthen Ringforts. As you round Slea Head there are fine views of the Blasket Islands, deserted since 1953 but remembered for its famous writers, such as Peig Sayers who is buried in the nearby graveyard of Dunquin. It was here in the Blasket Sound that several hundred men lost their lives when the Santa Maria de la Rosa, one of the ships of the Spanish Armada, sank on October 1st 1588. Items recovered from the ship can be seen at the very interesting heritage centre in Ballyferriter. Continuing on through the village is the ancient monastery of Riasc, worth visiting to see the Inscribed Cross Slabs. Gallarus Oratory, 3 km further east, is regarded by many as the ´jewel in the crown´. Built of unmortared stone it is still dry inside after over a thousand years. Our last stop Kilmalkedar has a 12th century Hiberno-Romanesque church, an Alphabet Stone close to the chancel door, Sundial Stone and 7th and 8th century stone crosses. Across the road is Saint Brendan´s House which dates from the 14th or 15th century. 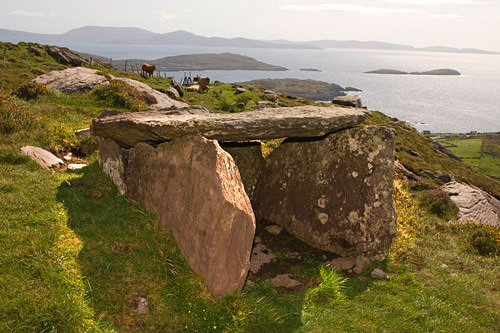 The Ring of Kerry is equally rich in archaeological remains. Fine example of Iron Age forts can be seen at Staigue near Caherdaniel and Cahergal and Leacanabuaile at Cahersiveen. There are also fine examples of medieval castles and monasteries. The jewel is Kerry’s crown are the 7th century monastic remains on Skellig Mhichíl, a world heritage site. Killarney has the oldest copper-mines in North West Europe at Ross Island in the Killarney Lakes. The stone circle at Lissivigeen is also worthy of none. In North Kerry the fine ruins of Ardfert Cathedral and the castle at Listowel town and Carrigafoyle near Ballylongford are worth a visit. A good place to start exploring Kerry’s archaeology is at Kerry Museum in the Ashe Memorial Hall, Denny Street, Tralee, County Kerry.